People often talk jokingly about snoring, but for someone who suffers from it, it can be a serious problem. For a snorer's partner it can also be a real nuisance, since their sleep will be disrupted most of the times. Another problem for a snorer is that he or she may be ashamed of it. Luckily, there are many solutions, treatments and products that can help you put a stop to snoring or at least reduce it. Besides the usual expert recommendations of GP's and ENT-specialists, you can find many other possibilities on the internet to do something about the snoring. Which remedy works best for you will depend largely on your personal situation. There are many products available that can help reduce or even prevent snoring. 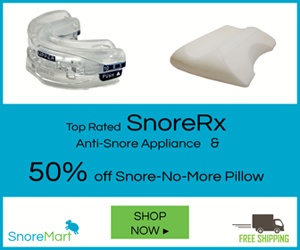 On about-snoring.com you will find a carefully compiled selection of the most frequently used anti-snoring products and other aids that can help prevent snoring. These are all available without a doctor's prescription. With the help of our price comparison, you will always find the most economical solution to your problem. Hopefully, with this information you will find THE remedy that suits you best, and a solution to your snoring issue. Whether you suffer from OSA can be established by way of a sleep study. If the conclusion of the sleep study is that you suffer from OSA, the most frequent mode of treatment is the CPAP (Continuous Positive Airway Pressure). This is a sleeping mask that provides a constant flow of air which keeps the airways open. In case you cannot get used to sleeping with a CPAP, in most cases a snoring splint (MAS) will be recommended. This is a mouth piece that you wear when sleeping. This splint moves the lower jaw slightly forward or keeps the tongue in the 'day position'. The tongue is a large muscle that relaxes during sleep. A snoring splint can make sure the tongue is kept in a tensed position. What is Sleep Apnea? And what are your options? Find out here! Learn more about this procedure, which can help reduce/cure snoring and/or sleep apnea.